Well, I have to say that this arc was a large improvement over the previous arc from the first collected edition. 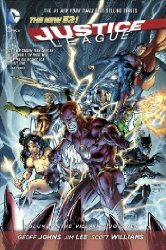 Taking place a couple of years after the events in Origin, we are thrown right into the action as the League discovers that several of the villains they have fought in the intervening years have been attacked themselves and have been forced to give up what they know about the League and its weaknesses. What follows is an interesting study into what it means to have the powers that the League has and exactly what kind of good they have been using those powers for. They are forced to reexamine their role in the world as the villain, Graves, uses what he learns about their weaknesses against them. But why does Graves want to destroy the Justice League? That's the big mystery! There are still some awkward story-telling moments, especially when referring to events that happened between Origin and this story, since to my knowledge, those events were never shown in any comics. Geoff Johns writing seems to be slightly tighter this time around, as he doesn't need to go through and re-introduce each character, which I found partly unnecessary. Jim Lee's art is astounding as usual, and the artists that stepped in to help finish up the issues all did admirable jobs themselves. Overall, I felt this was a much better story than Origin, but it looks like right as Johns and Lee are hitting their stride with this book, they are handing off the reigns to another creative team the book is be relaunched as Justice League of America. I'm not sure how that all plays out, but that's what the advertisements at the end of the volume seem to indicate. Either way, I think this is worth reading, and will probably pick up the next edition, just to see where this story is going now.